At Baja-Rentals.com we have been bullish on Baja Real Estate for many years. We have years of experience of investing in the Northern Baja region. of Baja-Rentals has now moved on to join the most credible team in the region. 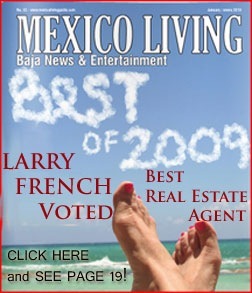 Click below to find out who Larry is now working with and how you can take advantage of his experience and success to meet your real estate goals in Baja. Let me take you on a tour of the area during your visit! Contact Larry French to find more information about Baja Real Estate. Rent before your buy ! I happen to have had the good luck to discover Baja after several trips to San Diego for professional meetings. While I fell in love with San Diego, after spending some time looking for possible real estate investments (?retirement?) I quickly learned that the value just was not there. A friend suggested a trip down to the Rosarito area, and I decided to take a look. What I discovered was the perfect blend of relaxation and adventure. The location is close enough to home to be comfortable, while the cultural differences make for an exotic adventure. I have found the Mexican people to be incredibly welcoming, and have had less hassle buying in Baja than I had in ANY of my real estate dealings in the U.S.A. Larry French possessed incredible knowledge of the area and guided us through the entire sales process to ensure the safe & secure purchase of our dream home..
sense of threat or danger. I have found the food, water and hygiene to be excellent in Baja, and look forward to many, many happy visits with friends and family. I have made numerous friends, and plan to make time in Baja a major aspect of my pre-retirement life!